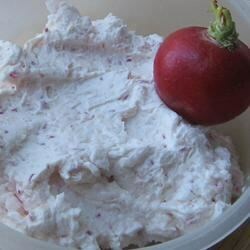 "This spicy radish dip is loved by all and so easy to make. Adjust the amounts of radish and garlic to suit your taste. Serve with crackers or vegetables." Mine turned out extremely runny. I used light cream cheese and was sure to dry the radishes (which were from the farmer's market and might contain more moisture than store-bought?). Delicious! My wife and I love it - especially using 1/2 the garlic and cream cheese with all the radishes! This was simple and delicious. I even carved my first radish flowers for this dip and it was a huge hit!